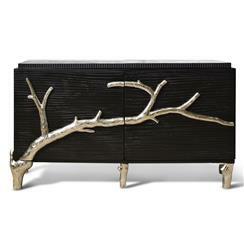 This eclectic media cabinet juxtaposes rustic and modern, black and silver, wood and cast aluminum. The eye-catching contrasts make this entertainment unit the focal point of your room. The solid wood frame uses three doors to house components on two interior shelves, while the slated back provides ample ventilation and space for cords.